Thai fishing boat. Photo by Sea Dave, Flickr. Following the publication of the paper “Thailand’s missing marine fisheries catch (1950-2014),” the Sea Around Us received an email from Thailand’s Department of European Affairs. We welcome such communications and engagements with countries. The electronic communication included a series of media statements that highlight a range of initiatives undertaken by the Prayut Chan-o-cha government to promote best practices in the fisheries sector. Thailand is considered the fourth largest seafood exporter in the world. According to official figures, the kingdom receives approximately $6.4 billion in fisheries revenues every year. But rampant illegal fishing and serious accusations of labour abuses occurring on Thai vessels have tainted the country’s record to a point where one of its biggest clients, the European Union, threatened a ban on seafood imports from Thailand if authorities did not take urgent measures such as strengthening laws against irregular operations and improving monitoring, control and surveillance systems, as well as the traceability of landings. The documents sent to the Sea Around Us are aimed at highlighting that Thailand is paying attention to scientific and journalistic research looking into its fisheries sector and that some actions are being taken to address some of the most urgent concerns affecting people on board of its boats. 1. A press release about a visit by the Thai Prime Minister and his cabinet to the central province of Samut Sakhon for a follow-up session on illegal fishing and labour issues in the fisheries sector. According to the brief, the politicians met with industry representatives, NGOs, human rights groups and fishers. After acknowledging that there are problems when it comes to labour standards, the officials requested all employers to register their migrant workers by March 31, 2018. Media reports have revealed that the country’s fishing industry employs some 100,000 foreign workers, many of whom are said to work under inhumane conditions. Besides talking about the registry, which was originally announced more than three years ago, the PM mentioned that Thailand has been using iris-scanning technology to capture data in order to track the identities of migrant workers and to help protect their rights. 2. A press release about an inspection related to illegal fishing carried out on February 8, 2018, by the Deputy Minister of Agriculture and Cooperatives in the eastern province of Chonburi. The document states that Minister Lak Wajananawatch noticed that certain initiatives to combat illegal fishing in the area are producing positive results. Among them, he cited round-the-clock vessel inspections at the Port-in Port-out Center. Such procedures include document checking, crew inspections, and boat inspections in order to ensure that they have Vessel Monitoring Systems. Minister Wajananawatch also praised a project aimed at improving the traceability of catches from Thai fishing vessels. The initiative asks fishers to report their catch in terms of quantities, weight and species identification, fishing location and fishing gears. Following the registration process, they are asked to fill out a Marine Catch Purchasing Document detailing how and to whom the catch is sold. 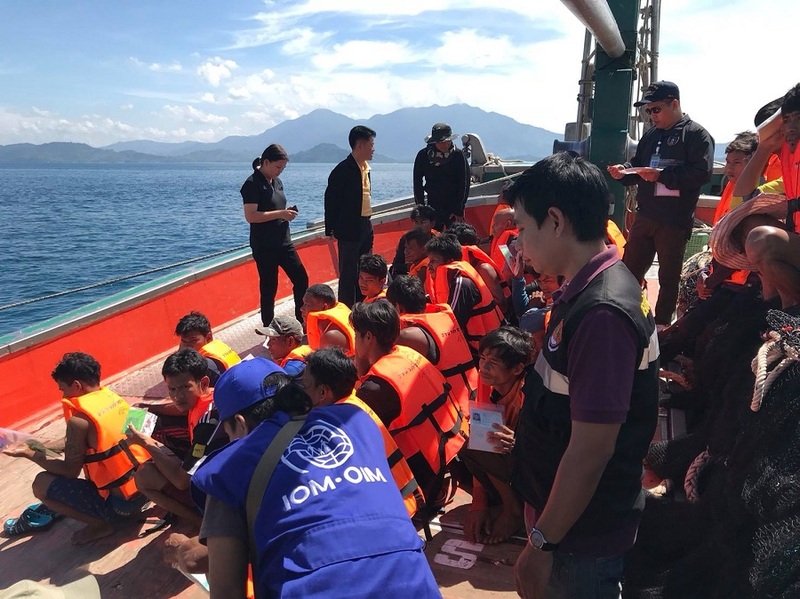 Reference image: Personnel from the International Organization for Migration with migrant workers on board of a Thai ship. Photo by IOM, Facebook. 3 . A press release stating that Thailand set up a mobile inspection unit that randomly inspects vessels and 31 Port-in Port-out Control Centers in 22 coastal provinces. According to the government, eight vessels were denied port-out because officials found inconsistencies between what they saw and previously submitted information about crew identification numbers and VMS serial numbers. One boat was fined more than US$16,000 for failing to record data in its logbook on fishing gear, catch on board, and seafarers working on the vessel. Once the results of each inspection were processed, authorities say they were able to rate the Port-in Port-out Control Centers according to their strengths and weaknesses with the idea of addressing shortcomings as soon as possible. 4. A press release detailing how the recently formed Special Chamber of Judges on Illegal Fishing Cases at the Criminal Court issued its first fine. Having spent more than nine months fishing outside Thai waters, the “Ruenglarp 9” received a US$64,200 penalty for failing to come back to port within the timeframe established by the Department of Fisheries. 5. A press release announcing the establishment of a “Working Group on Labour Relations Promotion in Sea Fishing Operation” integrated by government officials, NGOs such as the Life Quality Promotion Network Foundation, the Stella Maris Sri Racha Center, the Environmental Justice Foundation, and Human Rights Watch, as well as organizations such the Committee on Labour Reconciliation of Thailand and the International Labour Organization. “The Working Group’s mandate is to layout measures and recommendations to promote labour relations in sea fishing operations so they are in accordance with Thailand’s international obligations, for example, by establishing a labour network in the fisheries sector, providing advice on workers’ rights for better bargaining capacity and establishing a dialogue platform for employers and employees where workers in the fisheries sector can better voice their concerns and protect their rights accordingly,” the document reads. Thailand’s Demonstration Boat “Plalang 1.” Photo by the Thai Ministry of Foreign Affairs. 6 . A press release about the inauguration, by the Department of Fisheries, Nestlé, and the Thai Union Group, of the “Plalang 1.” The vessel is a “demonstration boat” where boat owners, operators and relevant authorities can attend training sessions and learn about proper living and working conditions such as the allocation of appropriate rest, dining and recreation areas, the installation of toilet facilities with adequate sanitation standards, and the provision of nutritious food, drinking water, and medical supplies. 7. 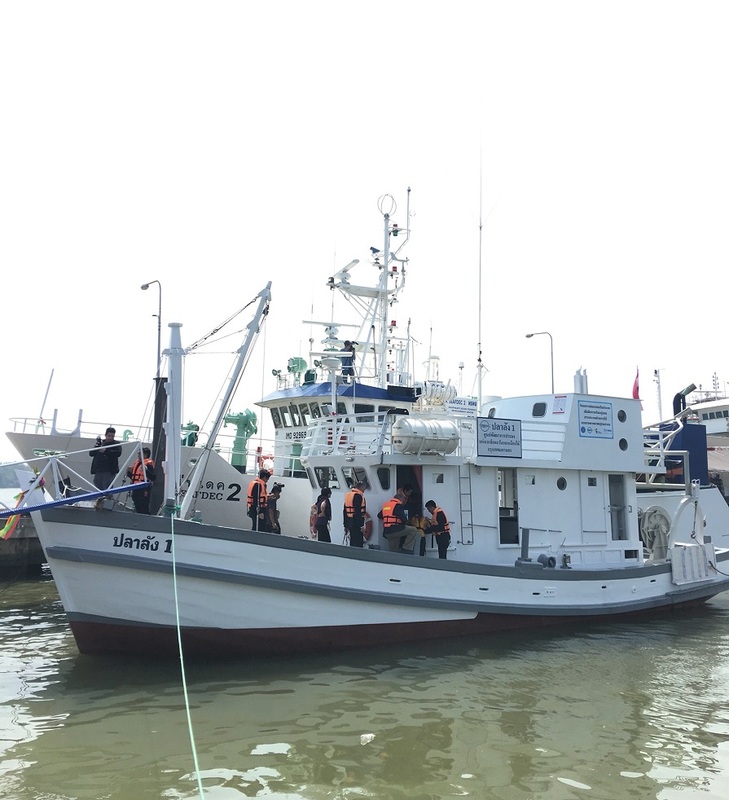 A press release highlighting that cooperation between different departments in the Thai Navy, the Thai-Myanmar Fisheries Coordinating Center and Ratchakrud Municipal Emergency Unit saved the life of a Myanmar crewmember who fell sick at sea. 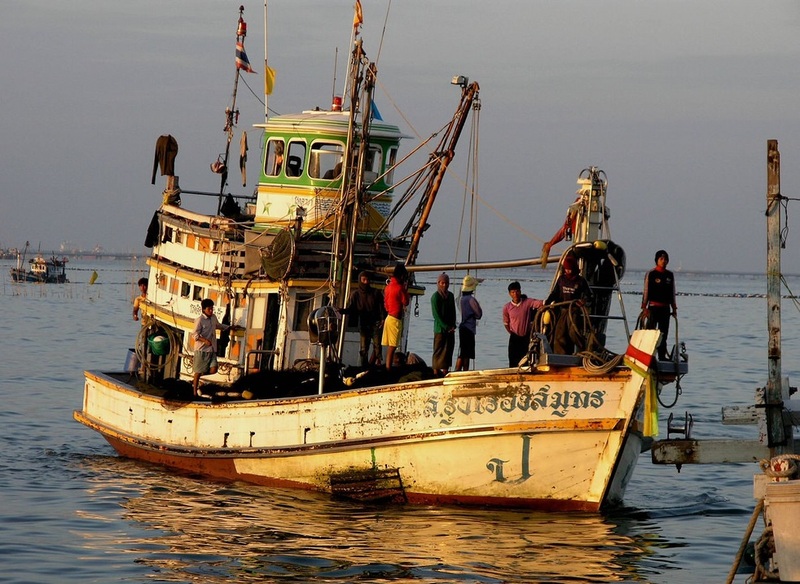 The Sea Around Us at the University of British Columbia and the Sea Around Us – Indian Ocean at the University of Western Australia applaud these actions to address pressing human rights and sustainability issues within the Thai fisheries sector. We hope for continuing and increasing efforts in the future to strengthen the application of the highest labour and fisheries management standards.